It’s convenient to think a web site has your data safe and sound, but that’s not always the case. 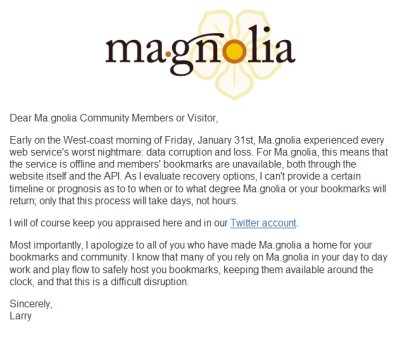 For Magnolia users the message, “Ma.gnolia has just experienced severe failure, we are aware of the issue and are looking for solutions” was proof. I hope they can recover the data, but if they don’t, all the users are left with nothing. This is just a friendly neighborhood reminder to think about backups when you can do something about it. Create a 3 or 6-month reminder to create backups and automate whatever else you can. You never know when you’ll be grateful you did. To figure out what to back up, ask yourself what you’d do if your data was erased. For instance: Tomorrow, you login to your Gmail account like you always do, but it’s completely empty. What do you do? If you’re crying, you should create a backup solution. Here are some backup solutions I have in place. Todoist (task list) – Todoist Export runs as a nightly cronjob on my web server. Gmail (email) – All incoming email forwarded to Yahoo Mail account, Zenbe as a POP client. I’ve also used Thunderbird to back up my account locally. Google calendar – export manually every 6 months, automatically synced with other calendaring software. I never thought about backing up online data – I should know better since I’m a database programmer. Guess I always assumed Google was on top of things, including backing up my email. Thanks for the tip! Marie, I used to think the same thing. Unfortunately, even Google has been known to delete email or disable accounts with no clear reason. Better to have your data backed up and not need it than the other way around. People will never know how long it takes you to do something. They will only know how well it is done.